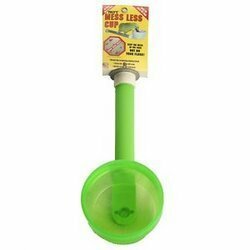 This perch, with an easy on and off cup is designed to reduce the mess on your floor. This is easily accomplished by centrally locating the cup in your bird's cage. You will be happily surprised when you see the mess is contained in the cage, NOT on your floor! This perch is designed to be comfortable by providing a secure non-slip gripping surface. The non porous surface is easy to clean.